Interaksyon.com reports that a fake concert poster of British band Coldplay spread on Facebook over the weekend and caused an uproar among Pinoys. 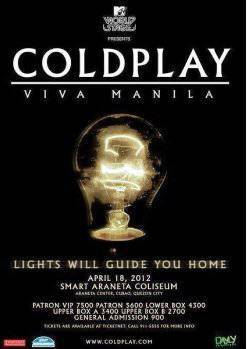 Interaksyon.com writer Abi Kwok observed: "The concert poster titled, ’Coldplay: Viva Manila’ with the subtext ’Lights Will Guide You Home,’ indicated that the popular band, which brought the hits ’Yellow’ and ’Fix You,’ will come to Manila on April 18, 2012." According to the posted, the said concert will be "held at the Smart Araneta Coliseum and presented by MTV World Stage." The poster even had ticket prices-with the VIP ticket set at P7,500. However, Kwok checked Coldplay’s official website and found out that the band would be holding a concert in Calgary, Canada on the same date it will supposedly hold a concert in Manila. Concert promoter Manila Concert Scene issued a statement on Sunday saying the concert poster was indeed a fake. It even went as far as naming the person who created the fake poster. The Interaksyon.com report further noted that Manila Concert Scene revealed that a certain Roe Alfaro was the person who created the fake poster. Manila Concert Scene likewise posted a screengrab of Alfaro’s status message, which read: "Okay. Guys, this is just a poster I made for my Computer Graphics class. It's not intended to spread any rumors or something. I know it's a bit disappointing for pushing up your hopes. I'm a fan of Coldplay too. I just want them here as much as you want them too. Anyway, I'm so sorry this kind of thing happened."